Home » Transportation » Was Vaya Africa Really Stolen From Hwindi By Econet? Was Vaya Africa Really Stolen From Hwindi By Econet? So there has been a narrative that comes up time and time again; Econet is a brutal company and they steal ideas from budding entrepreneurs and startups! 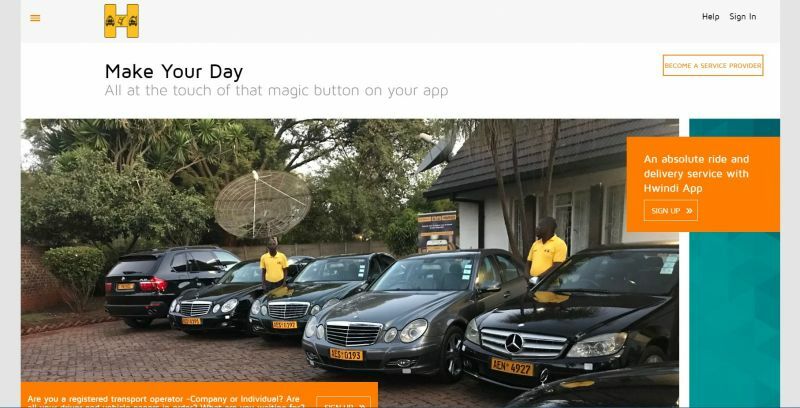 Cumii (an Econet subsidiary) recently launched their Vaya Africa ride-hailing app and Hwindi has surfaced kinda suggesting that they were copied. So what’s the issue here? A few weeks ago we managed to get access to Cumii’s Vaya Africa application and we wrote a preview of the application. After publishing this preview an interesting thing happened, Hwindi came out and voiced their issues with the appearance of the Vaya Africa website. Hwindi reached out to me directly and explained this and after taking a look I was also taken aback and I was quite surprised. The websites did indeed have some similarities and we were wondering what the issue was. We then got in touch with Cumii who explained that they had gotten this uber-like platform from the same Indian company who Hwindi also got their platform from. The platform is basically a white label – a product made by one company that other companies can rebrand to make it appear as if they had made it themselves. So both Cumii and Hwindi got this platform from one provider and when I asked Hwindi if this was the case they agreed. Hwindi still felt hard done by the fact that Cumii didn’t make changes compared to their first product which was the first to hit the market. I think therein lies the problem with this whole situation. 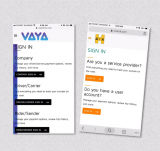 Vaya Africa hadn’t been launched and Cumii were still performing internal testing with the application. If it wasn’t for the fact that Techzim stumbled upon this app and wrote about it there wouldn’t have been an issue at all as there would have been no public interaction with the app until Wednesday night and what launched on Wednesday night doesn’t really look like what Hwindi launched. I think this is also why Hwindi has been very careful in all their communications thus far not to outrightly say that Cumii stole their intellectual property. Hwindi’s communication was very suggestive and played into an existing narrative that Econet steals ideas from the small guy and I’m sure they knew they would get some traction from it. If you didn’t know about Hwindi, now you do and that’s good for their brand especially if that also comes with the added sympathy of being the guy who was robbed. I’m not so sure if that really is the case and it seems Hwindi won’t commit on saying whether or not their intellectual property was copied. Those are the facts. I’m not entirely sure if there is an issue here but if your opinion differs from mine the comments section are always open and it will be great for us to continue this discussion there. What’s sad here is that we can’t build our own products but outsource simple work to Indian companies. I have to agree with you on this one, we need to see more software companies, developing these solutions locally and exporting. Its one FX avenue that i feel, as Zimbabweans we overlook. Techzim it would be nice for you to review home grown solutions being used outside our borders. We have to be competitive especially on the pricing model. Outsourcing to India is cheap especially when you are paying in USD as the Indian Rupee is a weak currency. yes exactly what came to my mind, like seriously?? When Hwindi guys first mentioned this issue, I responded saying both companies had used the same template. Unfortunately both used it out of the box and here we are. Hwindi knows it will never be able to stand against Econet, so they are on a smear campaign. Econet fumbles a lot and fall short often. Case in point, Ruzivo (Their user base is so small, its shameful), Ownai,,, I could go on. I don’t know maybe its because they are a big machine, but if you come with a nice strategy, you can beat them. I know competitor products that are killing them on market-share from Indie Devs. I still cant imagine that Econet couldn’t build their own application group up. Rather prefer copy and paste white labels. Well, the way i see it is this is all business. Econet is not an NGO or the government of Zimbabwe. Hence, they are not obligated to helping start-ups or refrain from implementing ideas from other players. Econet is a private player with the sole purpose of making profits legally. If what they have done with Vaya is ‘stealing’ then why is Hwindi not taking this up with the courts? Because they have NO CASE! Hwindi got their platform from the Indian Company and customised for our market then they exhibited their solution in front of all the Mobile Operators and more under the Ministry of ICT and Potraz Innovation Fund in 2016 funded by the Mobile Operators. The whole idea was to fund viable projects, incubate them till they can make it their own. So Hwindi had to dissect and give out their whole product, shareholding, developers, business plan, financial projections, etc under the ‘Potraz Protection’. Innovators raised the issue of protection since they couldnt afford full IP registrations and were assured that all ideas and solutions presented would be protected and would not find their way into the streets. Econet was the company that was highlighted as a threat by innovators and Potraz again assured all the exhibitors that non of that would happen. Hungry and thirsty innovators didnt think of getting all this documented and signed. Now 2 years down the line Hwindi manages to kick off successfully with their own resources and boom ECONET comes up with exactly the same platform from exactly the same developers and a word to word site. One now wonders what this whole ICT Innovation Fund and other hubs are for? Is it a noble idea? or just a big fishing basket for ECONET? Do you honestly think that the innovators are going to exhibit well? What is POTRAZ position in all this. They are just watching this unfold? 1. )i think it is also important to know that not all ideas are can go through or will succeed in IP registration.I am not sure of the logic behind having an IP over an existing solution that was customised for the local environment. 2. )When Hwindi was registered or when it started their app was targeting registered operators eg taxis etc so even if they had gotten an IP over that based on those conditions it will not have disqualified econet from entering the market. I personally do not think all this stuff about IP is good for the IT environment . . . If you have a very good and scalable product you will attract the right investment and it will not matter if your competitor has huge pockets.To increase innovation in Information Technology IPs should be completed removed,they discourage innovation. Thank you for the clarification TechZim. With the way Hwindi personnel are screaming ‘theft’ on Twitter you would think Econet even stole their office furniture! So Hwindi is complaining about something that they also borrowed from someone else? That’s school boy stuff 😂! This is confusing. Econet toiziva but who is Hwindi🤷🏾‍♂️? Ndere kuna Fourth here or ndere ku Coppa Cabbana? Econet is in the business of launching far too many products and ignoring them. Hwindi and Econet(Cumii) Programmers got the source code from the same source. Be it the Envato Code Market or whatever. Both apps are hybrid apps, not pure native. Probably written on Ionic or React Native. Nobody stole from anyone. Programmers from both fronts were lazy to code native apps for both Android and IOS. If they got the platform from the same developer then there is no issue , it’s sad that we can’t make our own apps .